Russia confirmed their place as the best sevens team in Europe. The leading European team in the World Series were comfortable winners of the European Grand Prix series. Elsewhere, however, there were surprises. The 2017 European Grand Prix was heavily overshadowed by the upcoming XVs World Cup in Ireland, taking away leading players from France, Ireland, England, Spain, Italy and Wales. In addition – especially in the second leg this weekend - Russia, Spain and France already knew they had qualified for the 2018 Sevens World Cup. The result was that for the rest of the teams in the tournament (for whom this was the centre of their season) faced something of a lottery. In Pool C, for example, Netherlands and Sweden found themselves up against Ireland and England – who were competing hard for their World Cup places – while in Pool B Portugal and Belgium found themselves up against a very inexperienced Spain side and a relaxed looking French team playing with what appeared a certain lack of focus. Given all of this, it was perhaps not at all surprising to see Russia retain their title. They were the leading European team in the World Series, and with no other distractions put out their best available teams. With the added incentive of home advantage in the second leg, they were even more unstoppable in the second leg than the first, conceding only 10 points all weekend while rattling up 100 points in their first two games alone. It was also not surprising (and despite resting players) to see the continent’s other World Series teams fill the rest of the podium places, both this weekend in Kazan and overall. Only the young and inexperienced Spanish team in Kazan lost any games to non-World Series opposition, to emphasise even more the yawning chasm that has now opened up between the top dozen or so teams in the world and everyone else – a gulf that expands every year. That said, the identity of the overall runner-up to Russia in the series was unexpected. In Kazan this weekend England – saying farewell to skipper Alice Richardson-Watmore - had their best European tournaments for some years, and arguably their best sevens tournament of 2017. Beating Ireland in the pool, after a series of defeats in recent weeks, was perhaps the highlight of Day One, while on Day Two a more comfortable win over Wales guaranteed their World Cup spot, to be followed with a win over France in the semi-finals before going down to Russia in the final. However, it was not they who finished runners-up overall, nor the French – who have been nip-and-tuck with Russia in this competition for the last few years. 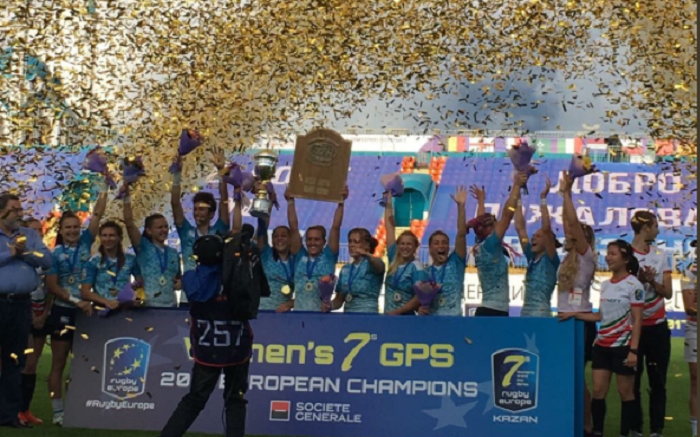 Europe’s second ranked sevens team is now officially Ireland, sneaking ahead of England and France thanks to two third places finishes – and a 40-0 thrashing of France in their final game that added to a far superior points difference over their two WSWS rivals. Of the non-WSWS teams, Wales were (as expected) the clear standout. On this form, they surely would be a World Series team now if they had been allowed to go to the promotion play-off in Hong Kong earlier this year, as they were by a significant margin stronger than any of the European teams that reached the semi-finals of that competition. Unfortunately, as they played as “Great Britain” in 2016 they did not qualify for that tournament, and now having missed out on the next year’s World Cup too (which will almost certainly act as the qualifier for the 2018-19 series) it will now be at least two years before the Welsh can hope to win a place at the top table. They will be at the Commonwealth Games next year, however, where they will be up against five World Series teams, including the best three teams in the world. How they get on there will be fascinating to see. Another team who will go home highly satisfied with their two weekends, and especially Kazan, will be Poland. It’s rare to see a recently promoted team be so competitive, finishing an impressive sixth this weekend and eighth overall. It should also not have been a huge surprise, given their performance last year to win promotion, but it is highly encouraging to see a new team like Poland come through and hopefully their upward trajectory will continue. Inevitably for all the ups there have to be downs, and it was the teams going in the opposite direction who perhaps were the biggest surprise of the series. Promoted Sweden were perhaps expected to struggle, and in a way are still a work in progress as they rebuild their international teams, but it is the identity of the team finishing 12th that surely no-one would have picked a month ago – the Netherlands. Given the history of the Dutch women’s team (both recent and back to 1982), the legacy of their high-profile Olympic bid, the talent identification structure, the coaching expertise and so much more the idea that they will be in the second-tier trophy series next year seems astonishing. Yet the performances the produced inevitably resulted in their 12th place overall. It is perhaps instructive that it was only when they were all-but relegated – when perhaps the pressure was of – that they begin to perform. Having to beat Italy 40-0 to make the quarters they just fell short with a 31-0 win, after which they went onto win the Challenge beating Spain in the final. In fact that Italian game was so like the Dutch in microcosm. Faced with having to score an unlikely 40, they threw the ball around and found themselves at 19-0 at half-time. The impossible had become possible – and the Dutch seemed to freeze, passes missed, balls not going to hand. Only when it was again impossible did they seem to relax and score points again.